I'm back today with another installment of a sneak peek. Tomorrow, on the Butterfly Reflections, Ink blog, I'll be sharing the full reveal of this "punny" card that I had a lot of fun creating. Today I'd like to talk about some of my favorite crafty tools. These items are a life-saver when card-making, and I believe that it's important to invest in something that actually helps you in your creative process. In my opinion, spending money on something that is going to help you increase your productivity is not a waste, but a wise use of your crafty allowance! :) All of these products are available at the Butterfly Reflections, Ink Shop. How awesome are all these layering stamp sets that are out there on the market? I am a sucker for anything that gives a realistic image, and there are lots of floral stamp sets that give gorgeous results when you layer them up in different shades of ink. The MISTI Stamping tool is very useful for layering stamp sets, mostly because of the time it saves you. Once you place the stamp on your project one time, it will always be in that spot, so the guess work is taken out of the positioning process! If you are mass-producing cards, using the MISTI is especially helpful. I am one of those total weirdos that likes fussy cutting my stamped images out. Sometimes when my creative juices are running dry, this is a great activity to do to stay productive and build up your stash of ready-to-use images. So, I'll camp in front of the TV and just cut out a bunch of images that I've stamped and colored. Matching die sets are wonderful, and I definitely have my fair share of them, but there's something extra polished about the look fussy cutting your images gives you. Having a pair of spring-cut scissors with fine needle tips is essential in getting good cutting results. These scissors can get you DEEP into the nooks and crannies of stamped images. Distress Inks are pretty much the best thing ever, am I right? If you're on the fence about whether or not to invest in the blending tool and foams, take the plunge. You won't be sorry! 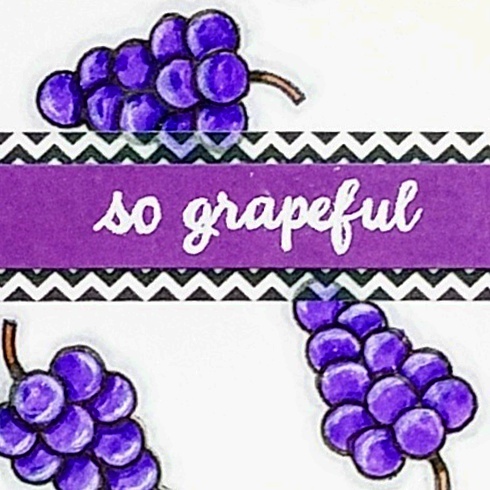 Sometimes when I'm not even making a card with distress ink techniques, I'll look at the finished product and think, "This needs a liiiiiitle.....something." I pull out my antique linen distress ink and my blending tool, and BOOM! Instant depth and variation in color that adds a lot of interest to the card and makes it look more put together. This tool is designed to work well with a heavy or a light hand when applying inks to your paper. I like that they are small and can fit under the base of the mini-distress ink cubes. On any given day, I am reaching for these three tools more often than not. They are a great addition to your crafty stash and some of my favorites to keep close at hand. Thanks for stopping by today and don't forget to check out my card on the blog tomorrow!